The hotel features 40 modern rooms, all floors are reached by the elevator, rooms equipped with every comfort needed for an unforgettable stay (toilet, shower, hairdryer, telephone, Satellite LCD TV with international channels, safe, heating and ceiling fans, air conditioning). There are different types of rooms to meet your needs. 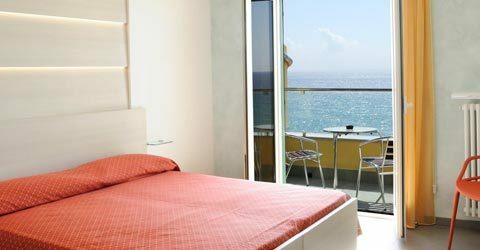 Sea view rooms with or without balcony / terrace, and, for those who prefer peace and quiet, hillside view rooms. We also provide cribs, cradles and comfortable bunk beds to enable children to enjoy their holiday.